German Federal Railroad (DB) compartment car, 1st and 2nd class, type AB4üm-63, (later the class ABm 225). UIC-X design (m cars). Model: The car has the chrome oxide green color scheme of the prototype from 1964 on. Realistically detailed trucks with a reproduction of the brake shoes and the generator mechanism. Unlighted red marker light inserts at the ends of the car. This car can be retrofitted with the 7319 plug-in current-conducting couplers or the 72021 working close couplers that can be uncoupledand it is ready for installation of interior lighting (2 x 73400/73401). Minimum radius for operation 360 mm / 14-3/16. Length over the buffers 28.2 cm / 11-1/8. DC wheel set 4 x 700580. 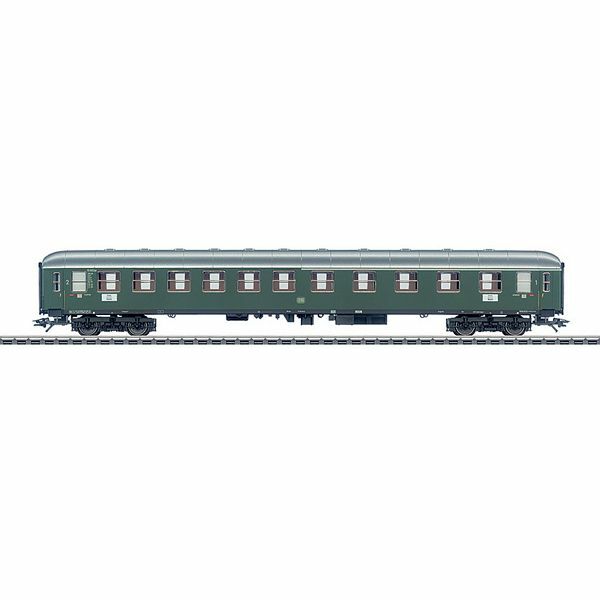 This car can be combined with the 43910, 43920, 43940, and 43950 car models to make up a typical Era III express train car consist.